Aloha Exchange Club President Winston Churchill, right, presents an ‘Officer of the Month’ award to Officer Edwin Namohala Jr. 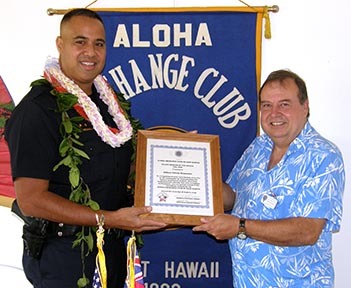 The Aloha Exchange Club of East Hawaii recognized Officer Edwin Namohala Jr. on August 28th as “Officer of the Month” for July. Namohala was honored for what Acting Sergeant Joel Field described as “outstanding performance and professionalism” during his work as a field training officer in the South Hilo district. 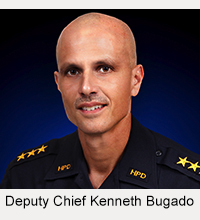 In nominating the officer, Field said that Namohala “is always very diligent and conscientious” in training new officers and that he often stays beyond his shift to help new officers learn the Police Department’s computer-based records management system. 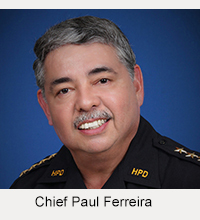 At a luncheon ceremony at Coqui’s Hideaway Restaurant in Hilo, Namohala said the credit really belongs to his supervisors and fellow officers. “I accept this as a group award for the men and women of the department that I work with,” he said.